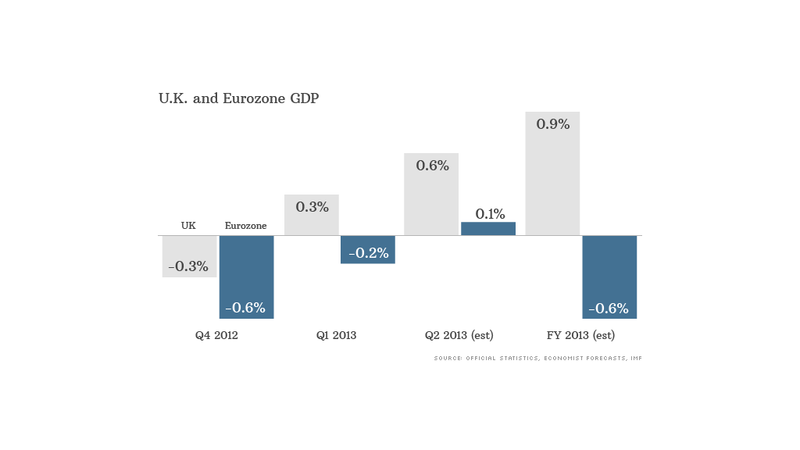 The U.K. economy is shifting up a gear and leaving its European neighbors trailing. Second quarter GDP figures for the world's sixth-biggest economy due this week should show growth of about 0.6%, twice the rate of expansion seen in the first three months of the year. By comparison, economists say the eurozone -- which publishes its own Q2 figures in August -- will struggle to do much better than stagnate or post the slimmest growth. It's on course for a second consecutive year of contraction as austerity measures, record unemployment and a wounded banking system continue to depress demand. Just last week, the Greek parliament narrowly passed a law to sack thousands of public sector workers and Portugal is struggling to meet the terms of its bailout. Southern Europe's woes have hit sentiment in Germany again, and combined with slower growth in China, are weighing on exports from the eurozone's top economy. The U.K. contracted for five consecutive quarters from the second quarter of 2008, and failed to grow for another nine months in late 2011 and early 2012 when the eurozone debt crisis was raging. But it bounced back from a weak end to last year with growth of 0.3% in the first quarter. Activity has accelerated since as rising asset prices encourage hard-pressed consumers to loosen their purse strings, despite continuing government spending cuts. Earlier this month the International Monetary Fund raised its forecast for U.K. GDP growth to 0.9% in 2013 even as it warned the recession in the eurozone would be deeper than previously expected. Private sector economists have made similar moves. "This growth in consumption will be underpinned by a lower saving ratio as households take comfort from a recovery in asset prices," noted UBS economist Amit Kara, as he upgraded his 2013 U.K. forecast to 1.1%. Home prices are increasing at their fastest rate in more than three years, helped by ultra-low interest rates and government programs that encourage banks to lend and make it easier for riskier borrowers to buy a home. The FTSE-100 hit an eight-week closing high last Thursday as strong retail sales data provided more evidence that recovery in the U.K. may be gaining momentum. Royal baby fever and a heat wave are helping drive spending. The labor market is also looking healthier -- unemployment is falling at its fastest rate in three years -- but with consumer price inflation still running at about three times wage growth (excluding bonuses), and no sign of a real pickup in investment and exports, some experts say the upturn remains fragile. "The U.K. recovery is so far unsustainable," says Rob Wood, chief UK economist at Berenberg. "[Bank of England Governor] Mark Carney needs to keep households from tightening their purse strings until the recovery is in full swing, but there is a decent chance that households wilt before the recovery can transition to a firmer footing." Falling inflation and stronger wage growth could put the economy on a more sustainable footing next year, provided U.K. exporters can take advantage of opportunities in the U.S. and China. "It would take a major crisis to halt this recovery, on the scale of the Euro crisis that crushed the last embryonic upturn in early 2012," said Peter Spencer, senior economic adviser to the ITEM Club. Earlier this month, the Bank of England and European Central Bank both moved to protect their economies from a Fed-induced spike in borrowing costs by signaling that they'll continue to provide cheap money for the foreseeable future.